VILLAS AND APARTMENTS TO RENT IN VILLAMARTIN, SPAIN. Welcome to our selection of holiday homes to rent in Villamartin, Spain. Villamartin is an urbanisation and golf course in Costa Blanca with a forty-year history with many developments being seen in recent years. From a village to a modern town, Villamartin has had to keep up with the increasing amount of tourism to the area and continues to keep attracting larger numbers. The Villamartin and Las Ramblas championship golf courses are the town's main attraction but there are many activities and entertainment on offer for the whole family including several large Blue Flag beaches close by. The golf courses both have an excellent character with many spectacular views of the Mediterranean Sea and landscaping that provides for a very pleasant game but also quite a challenging one; the 14th and 17th holes of the Villamartin course are known for being beside a treacherous deep ravine but the only danger is to your golf balls. After you've had a good game of golf, or perhaps after waiting for the golfer in your family to finish their game, the central plaza near the Villamartin golf course has the usual services and facilities, with many fine restaurants, cafes and bars to relax in with a nice wine and a quality meal. The plaza has several palm trees in its lovely-looking square that are home to African Ring Neck Parrots. These parrots are beautiful birds and visitors to the area quite enjoy their presence however they may be considered a pest by bar owners in the area due to their number. 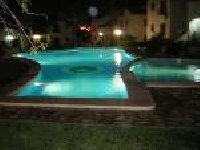 Looking for self catering holiday accommodation in Villamartin? Then below is a selection of apartments in Villamartin and villas in Villamartin that can be rented direct from their owners. You can either click on each listing for further details or you can use our search engine on the left if you are looking for something in particular.